Sunday’s travels in our trusty 2005 Toyota Prius were marred only by a flat tire. I wish to share two hard-earned bits of wisdom with other Prius owners, and potentially with owners of other front-wheel drive vehicles. 1. 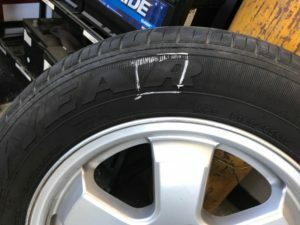 Don’t trust the included tire-changing jack. The crappy screw jack included with the Prius is useless. Literally. With the car on level ground, and with the parking brake set, the jack quickly tilted — and the car fell off the jack. Yes, the jack was set at the correct life point. On a second attempt, the car would have fallen again if we didn’t let it down quickly. In any case, the jack was extremely difficult to turn. Fortunately, someone gave us a ride to an auto-parts store, where we purchased an inexpensive hydraulic floor jack. That made quick work of the task, and the new jack will live in back of the car from now on. If you have a flimsy screw jack with your car, you may wish to upgrade to something more solid. 2. Don’t put compact spares onto the front. The flat was the front driver corner. Once the car was jacked up, it only took a few minutes to mount the compact donut spare. However, the car simply wouldn’t drive properly — the vehicle not only pulled to the left, but there were error lights flashing on the screen. Even with the pedal to the metal, the vehicle wouldn’t go over 30 mph, slowing to 15 mph going uphill. Uh oh! Thinking the problem through, we realized that the donut was throwing off the traction control system (which can’t be switched off with that model year). So we pulled over, swapped the donut to the rear, and put the rear’s full-size wheel/tire on front. (Thank you, hydraulic jack!) The car immediately drove correctly, plenty of pep, no pulling, and no error lights. The lesson: On front-wheel drive cars, always put the donut on the rear, even if that makes the wheel-changing process a bit more complicated. Note: There is nothing written about optimal placement of the compact spare in the car’s owners manual. So consider yourself advised on both fronts. The good news is that we made it home just fine. The bad news is the tire has a cracked sidewall. Time to go tire shopping! 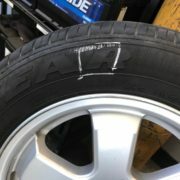 After 10 years of Prius ownership I had to remove a flat front tire. I found the jack handle difficult to use plus it kept wobbling all over the place. First attempt, the car slipped off the jack. Then blocked the rear tire. I had to quit and called AAA. They had nothing nice to say about the jack and handle. As it was on the front, I too experienced poor handling and acceleration due to the traction control system. The ‘skidding’ light was on constantly..Did not think of putting the donut tire on the rear.